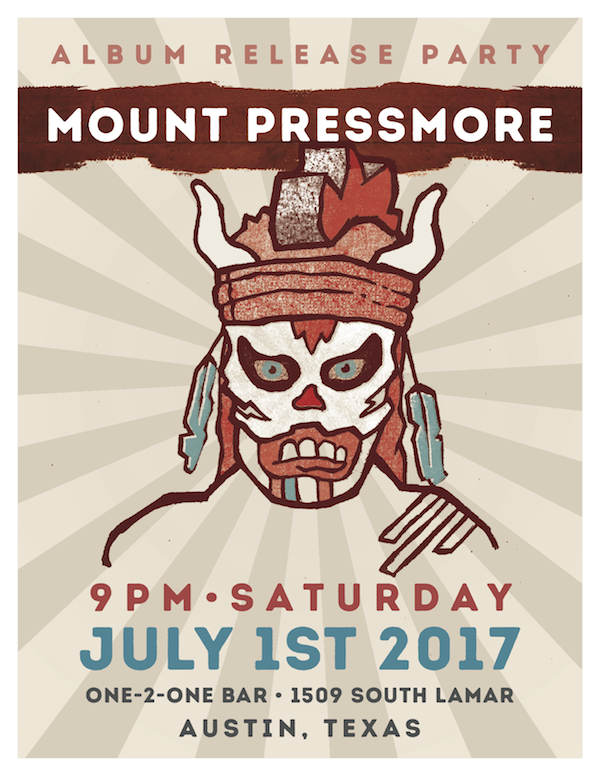 June 28, 2017 - THIS SUMMER, MOUNT PRESSMORE WILL BE RELEASING THEIR SOPHOMORE ALBUM, THE MASKED BATTLE. THE ALBUM RELEASE PARTY WILL BE HOSTED Mount Pressmore, is a band out of Austin that KUTX has compared to Frank Zappa and has otherwise been boldly described as "chop pop" on their previous album, Enjoy. This summer, Mount Pressmore will be releasing their sophomore album, The Masked Battle. The album release party will be hosted at One-2-One Bar, Saturday, July 1, 2017. The band is available for interviews immediately. Mount Pressmore makes music that crosses cultures and transcends categories. As KUTX described their previous album, Enjoy (2013), “It’s virtuosic, but it feels familiar.” It’s Herbie Hancock meeting Peter Gabriel in a Danny Elfman film score. It’s a comedy, for sure, but one that balances social satire with self examination. Emerging five years into the band's life span, The Masked Battle displays Mount Pressmore's deep chemistry, inveterate searching, and visceral style. As lead singer Thomas Shaw describes the record, "[It] removes a beating heart from its ribcage, stomps on it in compound time, and folds the remains into a sonic tapestry of alienation and anxiety."